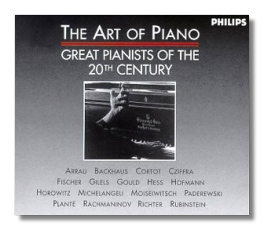 This attractive collection complements Philips's 100-volume, 200-disc collection of "Great Pianists of the 20th Century," which was completed in the past year. It also complements a television program titled The Art of the Piano, which is available on video as well through Warner Vision (3984-29199-3). This video contains some remarkable footage of all the pianists listed above. Much of that footage is limited by unavoidably dated sound, however. Also, there are few complete performances in the video. This collection presents the pianists playing the same works in complete form, and with sound that is more appropriate for repeated home listening. To do so, Philips has had to obtain material from many rival record companies, including EMI, Sony, and BMG. A rare spirit of cooperation, then, is behind these three CDs. The first ten pianists, as listed above, can be heard on the first CD. Perhaps because the pieces are shorter and the recordings are generally older, there is an emphasis on extroverted showpieces. The earliest recording (1922, from the acoustic era) is of Paderewski playing Liszt's most famous Hungarian Rhapsody. The most recent is Cziffra's 1954 recording of Liszt's Grand Galop chromatique. This disc also contains the first release of Myra Hess playing the first movement of Beethoven's "Appassionata" Sonata, recorded in 1945. The second CD contains two major works: Beethoven's Piano Concerto #4 played by Backhaus, and recorded in 1958 with Hans Schmidt-Isserstedt conducting the Vienna Philharmonic; and Gilels playing Beethoven's complete "Appassionata" (1973). Edwin Fischer is here too, playing Bach. The third CD opens with a recording of Tchaikovsky's Piano Concerto #1 (with Richter, and Yevgeny Mravinsky and the Leningrad Philharmonic, recorded in 1959), and closes with Arrau playing Beethoven's last sonata in 1965. A real curiosity on this last disc, one I've never heard before, is Glenn Gould's arrangement of Ravel's La Valse. Two-piano versions of this are difficult enough; on Gould's 1974 recording, he's a one-man band, and you won't believe what you're hearing. A page of the booklet is devoted to each pianist; there's a photograph and a brief biographical note about each. It doesn't hurt that Hofmann and Gilels are shown at their handsome best! It makes little sense to critique each one of these recordings. I suppose the target audience for this set is people who have seen The Art of Piano. This is a sampler that can be enjoyed by anyone who loves pianists, though, regardless of how much experience they have. There's nothing here that is short of remarkable. The only argument lies in the choice of pianists (which, I suppose, was governed by the video) and the repertoire (likewise). Gould playing Bach would have been more typical, and so would Paderewski playing Chopin. It really doesn't matter, though. If you are looking for a piano collection that is less superficial than most, this is an excellent choice.